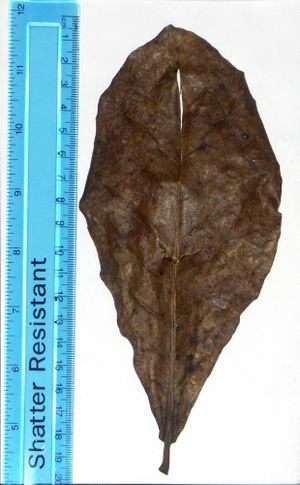 It is also thought that the large leaves (7-10" long) contain agents for prevention of cancers (although they have no demonstrated anticarcinogenic properties) and antioxidant as well as anticlastogenic characteristics. In fishkeeping the leaves are also used to lower the ph and heavy metals of the water. It has been utilized in this way by Betta Breeders in Thailand for many years. Hobbyists across the world also use them for conditioning the betta's water for breeding and harding of the scales. The tannins and other chemicals which are dissolved in the water by the decomposition of organic material is called Blackwater. There are many companies selling Amazon and African blackwater bottles. So Indian almond leaves may simply be Asia's equivalent. The leaves are now generally sold commercially in aquarium shops. eBay and AquaBid often have sellers of these items. The leaves are not expensive. Keep any unused leaves in an air and watertight container away from light and heat will ensure that any unused leaves will keep for at least 4–6 months. Assuming an average 15.2-25.4cm (6-10") long leaf, you use one quarter of this for every 4 Litres (1.1US G.) litres for Bettas or 1-2 leaves per 50 Litres (13.2US G.) for other species. Leave them in the tank for around 15 days in a filter bag or let them lie loose, they will sink after 2–3 days. Expect the water to tint slightly brown with the tannins. This page was last edited on 22 October 2018, at 05:44.